SLEEPS 8 ! FREE BEACH SERVICE MARCH -OCTOBER ! 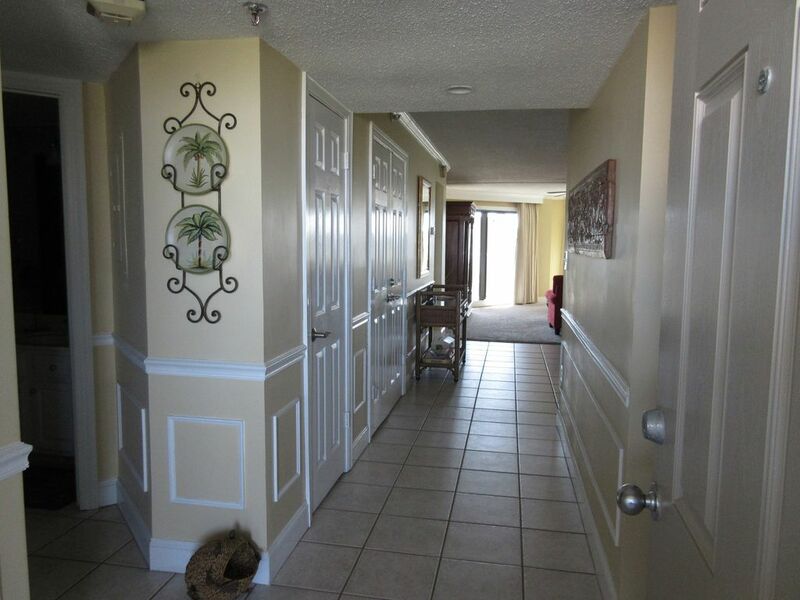 Gorgeous, Pet Friendly two-bedroom condominium in Destin. Recently upgraded interior in the oceanfront building. Azure skies and water make this a perfect getaway. Master bedroom has a king-sized bed, walk-in closet, dressing area ,and master bathroom, Guest bedroom has a king-sized bed, with adjoining bathroom. Perfect for two couples. There is a queen sized sleeper sofa for two more guests. Kitchen is fully stocked with coffee maker ,blender and all the comforts of home. Full sized washer and dryer in the unit. Two tennis courts on site. Pool with raised tanning deck and hot tub. Grilling area with picnic tables for entertaining. There are nearby restaurants, shopping, Big Kahuna's water park, The Track Amusement Park and much more. Lovely condo with gorgeous views of the Gulf of Mexico! Beautiful condo-well stocked (except for a frying pan), comfortably furnished and immaculately kept grounds, made for a wonderful week in Destin. We thoroughly enjoyed our stay! Looking forward to booking again next year for our annual family beach trip. As we were checking out my teenage son requested that we book this same unit again next year for our beach trip next summer. Unit was extremely clean and had all the comforts of home. Mrs. Toni was great and even called to make sure everything was up to our expectations. We could not have been happier. Beds were comfortable. Kitchen well stocked. Appliances in great condition. View from balancing was remarkable. Will definitely be booking this unit again! First time at this condo. It was spacious, warm, comfortable, very welcoming and clean. The pictures do not do it justice. We felt so at home here. The kitchen had everything we needed expect groceries and a chef would have been nice haha! The views of the gulf from the balcony were breathtaking. Everything from beach, pool, tennis courts, outdoor grills, hot tub, shuffle board and more were just steps away. The staff at Inlet Reef were courteous and very helpful especially for newcomers like us. There are many wonderful restaurants, shopping close by. We would recommend this condo to anyone who would like a great week at the beach with all the comforts of home. Beach vacation at it's best! Every time I come to this gorgeous condo, I am stunned by its spaciousness. Everything we need is here except the groceries. We sit on the balcony and enjoy the awesome view of the Gulf and the bay as we sip our coffee and read books. Being right on the beach makes it easy to slip back and forth from condo to water in a matter of minutes. There is a huge heated pool with hot tub, bathroom, showers, and grills. Convenience is everything! We will be back this summer. My home away from home. Love it! This was our 2nd stay in Destin at this unit. The owner is very pleasant and easy to work with and checks to make sure everything is ok. The unit is very comfortable and homey. A perfect place to relax and enjoy your vacation. You will find everything you need from a kitchen that is well stocked with everything but food to very comfortable beds. Beautiful view of the gulf. Easy access to the beach, pool, hot tub, sauna, tennis, and suffleboard. Very good dining, shopping ,grocery stores just minutes away. Security is 24-7. You won't be disappointed in this unit. We had a great time at Inlet Reef. Our unit was spacious, well maintained and well equipped. We had a great view and will definitely book this unit again!